For Ada and Piper Spencer, singing is as natural as breathing. Blessed with talent and determination, these sisters hope to fulfill their dream of performing on the stages of Nashville. But there's a family secret the girls never knew. In his younger years, their dad chased his own musical dreams before he met their mom, before he joined the marines, and before he lost his life in Iraq many years ago. Ada and Piper never got to know their father. But the chance discovery of a letter leads the girls on a quest to discover who he really was. As they learn the truth about their dad and the choices he made, they also get a better understanding of themselves and the special bond that holds their family together. I found this DVD at my local library and I'm glad I did. It's a sweet and wholesome movie that I enjoyed very much. Two Tennessee teens Ada (Kaitlyn Bausch) and Piper (Cozi Zeuhlsdorff) are aspiring country singers and songwriters. Their father had been killed in the Iraqi War and when they find his Silver Star and a letter detailing his heroism, they want to know more about him despite their mother (Amanda Detmer) not wanting to talk about the past. The acting all around is solid, with Myra Turley, Ronny Cox, Matthew Barnes, and Laura Bell Bundy adding lots to the film. 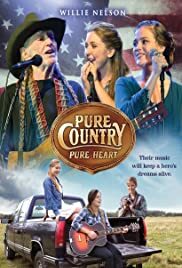 They'll be plenty of wonderful country music throughout, but if you're looking to see a lot of Willie Nelson, he only appears for one song near the end of the movie. Overall, I just found this film, directed by Damon Santostefano and written by Holly Goldberg Sloan, to be a poignant and sweet tale, that the whole family can enjoy.